Increasingly, conventional wisdom places the fundamental blame for the worldwide downturn on people's desire--particularly in places like the U.K., the U.S. and Spain--to own their own home. Acceptance of the long-term serfdom of renting, the logic increasingly goes, could help restore order and the rightful balance of nature. Homeowners also get spanked by leading new urbanists, like Brookings scholar and urban real estate developer Chris Leinberger. He lays blame for the downturn not on unscrupulous financiers but squarely on aspiring suburban home buyers. "Sprawl," he intones, "is the root cause of the financial crisis." If only we built more high-density, transit-oriented housing--which, incidentally, is not exactly thriving--the crisis could be happily resolved, he believes. This approach is echoed by big-city theoreticians like Richard Florida, who believes that both homeownership and the single-family house "has outlived its usefulness." In his "creative age," we won't have much room for either single-family homes or owners. Instead, we will be leasing our ever-more-tiny cribs--just like yuppies with their BMWs--as we wander from job to job. To be sure, many people who bought homes in the last few years should not have qualified. Weak lending standards, promoted by both unscrupulous industry figures like Countrywide's Angelo Mozillo as well as Congress--including the many "friends" receiving cut-rate loans from the disgraced mortgage firm--clearly made things worse. Yet the recent real estate debacles should not obscure the tremendous positives associated with homeownership. Widespread and diffuse ownership of property has been a critical element in successful republics, from early Rome and the Dutch Republic to the foundation of the United States. Jefferson held that "small land holders are the most precious part of a state." In the ensuing generation, progressives embraced widespread ownership of property as central to democratic aims. Lincoln's Homestead Act stands out as a prime example. Even by the 1940s, this model was only partially realized. Barely 40% of the population owned their homes. Homeownership remained confined largely to small-town denizens and the urban upper classes. No one in my mother's family--growing up in the tenements of Brownsville, Brooklyn--even considered homeownership an achievable goal. It was hard enough simply to pay the rent and put food on the table. Yet by the 1960s, rising prosperity and government-subsidized loans helped most of my numerous aunts and uncles own their residence. Presidents from Roosevelt to Clinton all identified homeownership as a critical social goal. Government loan programs exploded as housing starts doubled in the post-war era. By 2005, the homeownership rate was approaching 70%. This trend also took place in other advanced countries, from the U.K. and Australia to Canada and Spain. It reflected what the Italian urbanist Edgardo Contini once referred to as "the universal aspiration." In some cases, such as Japan, societies that had been divided between landlords and peasants for millennia now boasted a huge, and growing, cadre of small owners. In virtually every country, this was largely a suburban phenomenon. People bought houses where land was cheaper, stores and schools newer. Here, too, people could transcend the often confining social limits of the old neighborhood. It was also, as the novelist Ralph G. Martin, noted "a paradise for children." Through all this, the chattering class never lost its contempt for homeowners and their suburban refuges. Old gentry long disliked the idea of dispersed ownership of property--even if many got rich selling their own estates to developers. Aesthetes disliked the seemingly banal housing tracts "rising hideously," as Robert Caro put it, from the urban periphery. This critique was applied not only to Queens and Long Island but also to places like Milton Keynes or Basildon outside London, and greater Tokyo's Chiba prefecture. Along with the fashion police, the new owners also took criticism from their urban betters, many of them also owners of country homes, for deserting the city. Some on the left feared the homeowners as a bastion of conservative politics. Architects, planners and developers identified them as opponents of their grand plans to refashion suburbia into a denser, more rental-oriented environment. Yet, despite the disdain, the dream of homeownership survived. Many boomers, who in their 1960s radical phase denounced suburban tracts as sterile and racist, meekly ended up buying homes there. So, increasingly, did middle-class minorities, whose rates of homeownership rose faster after 1994 than that of whites. To be sure, the financial crisis has led to a sharp drop in levels of homeownership, as occurred in the last big recession of the early 1990s. In the future, some suggest that aging boomers will force the home market to collapse even more due both to the current mortgage meltdown and changing demographics. Yet there are limits to how far homeownership will drop. Urban boosters, apartment-builders and greens--all advocates of expanding the renter class--tend to ignore several key facts. For one thing, the vast majority of boomers are holding onto their mostly suburban homes far longer than ever suspected. Many will remain there until forced into assisted living, nursing homes or the cemetery. Then we have the X generation, who, if anything, has favored large homes and exurbs in large numbers. In addition, behind them lie the large cohorts of millenials, who according to surveys conducted by generational chroniclers Morley Winograd and Mike Hais, prioritize the ownership idea even more than their boomer parents do. No doubt, the weak economy will slow this generation's push into the home market. However, by the next decade, as this generation enters the late 20s and early 30s, they will find their economic footing and be ready to enter the market for houses in a big way. The real question then will become which companies and regions will meet the expanding demand. Over the past decade, we saw the demand for housing push middle-class families toward destinations as varied as Las Vegas and Phoenix, Austin, Houston, Dallas and Atlanta. Others have started heading to more affordable markets in the nation's heartland, to the metropolitan areas like Kansas City, Des Moines and Sioux Falls. This shift will create huge opportunities for a diverse set of geographies. For urban areas like New York or Los Angeles, there will be a unique--perhaps once in a generation--chance to induce middle-class people to settle down in big-city homes or condominiums. If they become homeowners, they will be more likely to stay than move elsewhere to the suburbs or other regions when the time comes to buy a home. Sadly, some policymakers in Washington seem less than enthusiastic about this prospect. Many close to President Obama seem to dislike single-family homes and suburbs. Some embrace the policy which the British called "cramming," essentially forcing people into ever smaller, denser units. Energy Secretary Steven Chu recently praised the notion of small apartments with numerous people. "You know, body heat keeps a lot of the apartment warm," he suggested. You can't do this in a big apartment with a few people." My suspicion is that most Americans are not quite ready to become their own heaters, any more than modern farm families like having farm animals live with them--although they, too, generate warmth. Instead, we should explore less unpleasant ways to cut energy use though such things as incentives for decentralizing work, promoting home-based labor, more tree planning and effective insulation. An administration that places itself at odds with the "universal aspiration" that has driven growth in the advanced world for over a half-century could delay a full recovery unnecessarily. Advocacy of what amounts to declining living standards and a return to feudalism might also prove a less than successful political strategy. Submitted by Richar1122 on Sat, 06/08/2013 - 06:56. Submitted by ryan1122 on Sun, 06/02/2013 - 07:12. Submitted by ryan1122 on Wed, 05/29/2013 - 09:43. Submitted by Monag111 on Wed, 04/24/2013 - 09:03. Submitted by NellyHills on Tue, 05/10/2011 - 07:14. There's no way home owners caused the recession. Wall Street and Congress caused it way before Bill Clenton,George W.Bush and Obama got into office. It goes much deeper than home owners. We have to think about why home owers are struggling to pay for their homes. Why people are loosing jobs. Even the news about small business employment shows that more money was earned in April due to the job growth and more hours worked. We know why we think congress but do you know Wall Street as well. We put too much stock in the prison industry. We need to stop locking up people for minimal crimes and start educating and counceling them. Not real criminals. The one's that are innocent locked up for being the wrong color. There's no telling how many great mind's that are behind bars. People change, especially when given a chance. More educated people walking around, more businesses get started, more jobs being made. The more educated leaders, the more money starts to move in this nation, more houses and cars baught. No need for a govenment stimulus plan. Submitted by sally on Wed, 04/06/2011 - 06:43. I get the picture now and the experts are right, home ownership has a deep mark on the current financial crisis. A lot of people shouldn't have qualified for buying a home and their insolvency led to instabilities that affected and crushed the system in a domino pieces pattern. I should consider myself lucky that I own a home, the only thing I have to pay for is my home insurance and this will never affect my credit score. Submitted by Greg Critser on Thu, 07/02/2009 - 10:46. An interesting article, although I am not sure I buy into the author's continuing series of false dichotomies about urban-suburban interests. The big cities, along with the suburban metros ( whose real estate interests underwrite much of his campaign) are actually one and the same: the maintenance of a regulated, balanced housing policy that learns from the mistakes of the past (many) and uses them to restore confidence in such for the future. There is no evidence that Richard Florida or, for that matter Chu, --the author's all-purpose boogymen--exert any weighty influence re housing policy. Rather, they are part of a transitory intellectual establishment who will inevitably get smacked by the realities of what most Americans want: a nice house that they own, whether urban or suburban. Their influence will be transitory, but perhaps needed to temper the extreme environmental disasters often perpetuated by developers, who build, yes, soul-less suburbs gouged out of the green hills that surround some of our biggest cities. Suburbs need to be urbanised and greener, and cities need to be suburbanised and greener still.This isn't a "gentry" philosophy. It's a real one. Submitted by jg on Thu, 07/02/2009 - 18:49. I enjoyed the article, Mr. Kotkin, but have to agree that you are framing the argument too heavily into Urban v. Suburb. Similarly the Heartland v. Coasts (NYC and LA) argument leaves out many cities that fit neither model. Though the housing crisis has been without a doubt regrettable, financial downturns do offer great opportunities for those who have lived below their means and the next generations (of home buyers in this case.) I believe this very point, you nicely made regarding cities which have become too expensive for even themselves, such as New York. Still I take issue, as I believe Mr. Critser did above, with idea the federal executive administration has placed itself at odds with the “universal aspiration” of homeownership. Mr. Kotkin provided only one rather odd quote from the energy secretary to support such claim. (I am aware other examples do exist, though challenge they would be sufficient to support such claim.) Though nothing surprises me often in politics, I cannot imagine this was Secretary Chu’s true rational for advocating smaller square footage in American homes – I do hope to find the quote in context. Henceforth, I found your concluding remarks based upon the quote itself a poor way to finish a rather interesting article on the future of home ownership in America. Submitted by Richard Reep on Tue, 06/30/2009 - 15:59. It is inevitable that the blame game for this mess is now trying on the "blame the homeowner" theory. Wall Street has obviously had enough of the blame and wants to share it. Well, there is plenty to go around. So the homeowners who fell for all the manipulative marketing in the so-called "ownership society" are now being blamed for their weaknesses? Sure, a lot of people who had no business investing in real estate did so, but to cast all homeowners as the bad guys is just a little too Karlrovian for good taste. I reject the argument that homeowners are to blame for this crisis and instead want everyone to look in the mirror and say "perhaps we are all suffering and we all deserve some karmatic rebalancing". Submitted by Jessi14 on Tue, 06/30/2009 - 14:08. 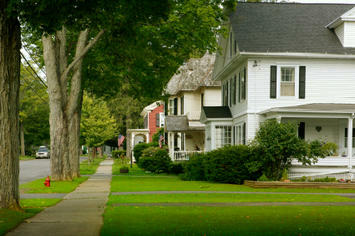 What do you think about the commentary that the housing market has stabilized? In my opinion, that is probably only projected from large metropolitan cities who tend to be wealthier in general, especially the West Coast where prices are low but housing sales have increased. I don’t think the month of April is enough to predict that housing will pull out of the recession first if consumers aren’t confident, which they aren’t. Look at this analysis of the market. Definitely certain regions are seeing an increase but only larger cities. Middle class families still struggle with the recession and wealthier families may be moving to the Midwest to buy their affordable housing, further increasing the gap from the families there who are unable to buy. Hopefully the lower prices mean more will qualify for loans, but not if their credit has been hurt from the recession.